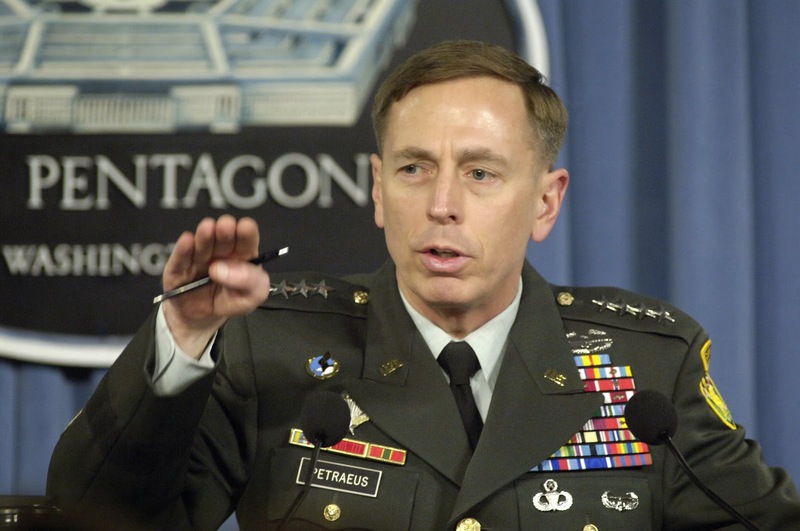 General David Petraeus at a press briefing in 2007, at the height of the Surge in Iraq. Tempos Interessantes has been defending throughout 2014 up to now that the (mostly) American intervention against the Islamic State is geopolitical mistake. The main point I have made is that the Islamic State is mostly a threat to Syria and Iraq. These states are, at best, Iran’s closest allies; at worst, they are Iran’s proxies. They are surely dependent upon Iran. In turn, Iran is the most serious threat in the Middle East, namely to Saudi Arabia, Israel, the Gulf States and even Turkey. Conversely, being a threat to American allies in the Middle East, Tehran is a threat to the United States’ interests too. Reading a very interesting and rather candid interview by General David Petraeus, the architect of the 2007/08 Surge that turned the tide of the Iraq War, to the “Washington Post” (Petraeus: The Islamic State isn’t our biggest problem in Iraq at http://www.washingtonpost.com/blogs/worldviews/wp/2015/03/20/petraeus-the-islamic-state-isnt-our-biggest-problem-in-iraq/?wpisrc=nl_headlines&wpmm=1 ) I found quite a few of my views validated by a man with great on the ground knowledge and experience of Iraq and the Middle East. The complete pullout of American troops from Iraq in 2011 spelled trouble from the beginning. First, the decision stemmed not from an evaluation of the situation on the ground, but from Barack Obama’s urge “to end a war” which was effectively long over (Obama’s Wars - 1 A Guerra que Já Não Era, 08/02/2012 at http://tempos-interessantes.blogspot.pt/2012/02/obamas-wars-guerra-que-ja-nao-o-era-com.html . He actually just facilitated its return. David Petraeus denounces both mistakes. His indictment of the US withdrawal is understandably mild but very perceptive. His indictment of Nouri Al Maliki is clear cut and definitive – he was a catastrophe that befell Iraq. What has happened in Iraq is a tragedy — for the Iraqi people, for the region and for the entire world. It is tragic foremost because it didn't have to turn out this way. The hard-earned progress of the Surge was sustained for over three years. What transpired after that, starting in late 2011, came about as a result of mistakes and misjudgements whose consequences were predictable. And there is plenty of blame to go around for that. The proximate cause of Iraq’s unravelling was the increasing authoritarian, sectarian and corrupt conduct of the Iraqi government and its leader after the departure of the last U.S. combat forces in 2011. The actions of the Iraqi prime minister undid the major accomplishment of the Surge. [They] alienated the Iraqi Sunnis and once again created in the Sunni areas fertile fields for the planting of the seeds of extremism, essentially opening the door to the takeover of the Islamic State. The tragedy is that political leaders failed so badly at delivering what Iraqis clearly wanted — and for that, a great deal of responsibility lies with Prime Minister Maliki. As for the U.S. role, could all of this have been averted if we had kept 10,000 troops here? (…) I certainly wish we could have tested the proposition and kept a substantial force on the ground. For that matter, should we have pushed harder for an alternative to PM Maliki during government formation in 2010? (…) But certainly, a different personality at the top might have made a big difference, depending, of course, on who that individual might have been. (…) our withdrawal from Iraq in late 2011 contributed to a perception that the U.S. was pulling back from the Middle East. This perception has complicated our ability to shape developments in the region and thus to further our interests. There is a serious risk of deepening and perpetuating the sectarian hatred which will result in an ever more divided Iraq, with the Islamic State wreaking havoc in the North and the West, plus in neighbouring states, and the Shiite assuming even more absolute control of the central state and increasing its dependence on Iran. The Middle East wars currently rage to the beat of the Sunni-Shiite confrontation and the Saudi-Iranian rivalry. The United States opted for the easy target (the IS) but she will in time find out that fighting the Sunnis with the help of the Shiites in Iraq and fighting the Shiites with the help of the Sunnis in Syria is an impossible balancing act. Especially when the Bad Guys abound and there is a severe shortage of Good Guys. This very week, Human Rights Watch has accused Shiite militias and Iraqi security forces of committing atrocities, including the erasure of 30 villages and the killing, abducting and expelling of numerous Sunni inhabitants. (…) I would argue that the foremost threat to Iraq’s long-term stability and the broader regional equilibrium is not the Islamic State; rather, it is Shiite militias, many backed by — and some guided by — Iran. (…) they have, to a degree, been both part of Iraq's salvation but also the most serious threat to the all-important effort of once again getting the Sunni Arab population in Iraq to feel that it has a stake in the success of Iraq rather than a stake in its failure. Longer term, Iranian-backed Shia militia could emerge as the preeminent power in the country, one that is outside the control of the government and instead answerable to Tehran. (…) we need to recognize that the #1 long term threat to Iraq’s equilibrium — and the broader regional balance — is not the Islamic State (…) The most significant long term threat is that posed by the Iranian-backed Shiite militias. If Daesh is driven from Iraq and the consequence is that Iranian-backed militias emerge as the most powerful force in the country — eclipsing the Iraqi Security Forces, much as Hezbollah does in Lebanon — that would be a very harmful outcome for Iraqi stability and sovereignty, not to mention our own national interests in the region. In two posts in June 2014, Geopolítica Passiva ou Dynamic Balance of Power, (20/06/2014 at http://tempos-interessantes.blogspot.pt/2014/06/geopolitica-passiva-ou-dynamic-balance.html ) and in February 2015, Quem Manda no Iraque (28/02/2015) at http://tempos-interessantes.blogspot.pt/2015/02/quem-manda-no-iraque.html ), it was pointed out that Iran is the major geopolitical threat to the United States’ interests, not to mention those of her allies, in the Middle East. The current Iranian regime is not our ally in the Middle East. It is ultimately part of the problem, not the solution. The more the Iranians are seen to be dominating the region, the more it is going to inflame Sunni radicalism and fuel the rise of groups like the Islamic State. While the U.S. and Iran may have convergent interests in the defeat of Daesh, our interests generally diverge. The Iranian response to the open hand offered by the U.S. has not been encouraging. Iranian power in the Middle East is thus a double problem. It is foremost problematic because it is deeply hostile to us and our friends. But it is also dangerous because, the more it is felt, the more it sets off reactions that are also harmful to our interests — Sunni radicalism and, if we aren't careful, the prospect of nuclear proliferation as well. It is frankly surprising to me that this is not recognised by most analysts. Iran is playing with a vulnerable hand and is, nonetheless scoring points in multiple chessboards: Iraq, nuclear programme, sanctions, Syria, Yemen and the Middle East balance of power. General Petraeus sees and understands what is happening in Iraq. Even I can see and understand what is happening in Iraq. The Israelis, the Saudis, the Egyptians, the Emiratis see it too. Not the Obama administration, blindfolded as it is in its quest to get a signature on a dubious piece of paper. This (unsurprising) description of this savage behaviour by the Shiite militias begs the question? What is the Coalition doing? What does it expect to accomplish? It is clear that, if continued, this pattern will only aggravate the sectarian nature of the fight, making the Shiite forces the Islamic State’s best recruiter. And a deeply entrenched sectarian conflict will be relished by the IS, because sectarian strife is embedded at the core of its ideology and beliefs. It is time for the United States government and its Western allies to acknowledge they are dealing with two rattlesnakes and leveraging one to strike at the other will likely bring a strong backlash in the near future. O Fim da "Tranquilidade Agitada"
Paga o que Deves, Malandro!! !